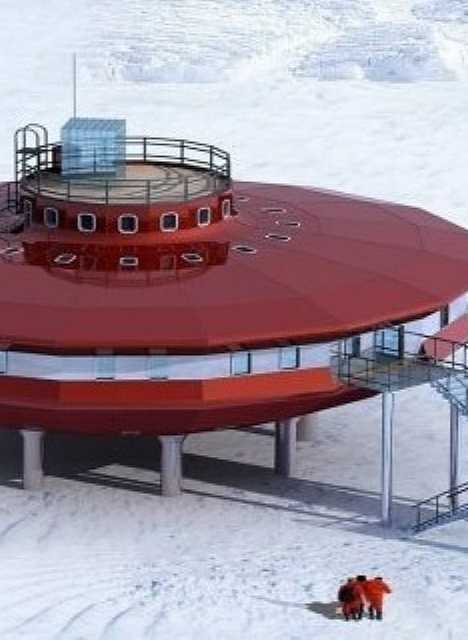 The flying saucer-shaped Taishan Antarctic Research Station, opened in early February of 2014, is China’s fourth research station on the world’s southernmost continent. It took just 45 days to build the station from prefabricated parts brought to the site by helicopter and snowcat. Said by its builders to be modeled after a traditional Chinese lantern, the Taishan Station’s space age architecture is actually quite practical: the centralized floor plan helps retain heat while the entire structure is raised high on stilts to prevent the accumulation of blowing and drifting snow. If conditions get too bad, however, staff can presumably blast off and rendezvous with the mother ship. Established in 1957 by Japan’s National Institute of Polar Research, Syowa (or Showa) Station was the first of four Japanese antarctic bases and is by far the largest, comprising more than 60 separate buildings. Located on the coast of Queen Maud Land on East Ongul Island, Syowa Station enjoys a balmy (for Antarctica) climate in which exposed rock is abundant and rainfall has been noted on occasion. Nevertheless, classic winter weather is common ANY day of the year and an abundance of sea ice once kept the station’s supply ship from paying a port call for over two years! The ship was finally able to reach the station in January of 2014 on its third attempt. 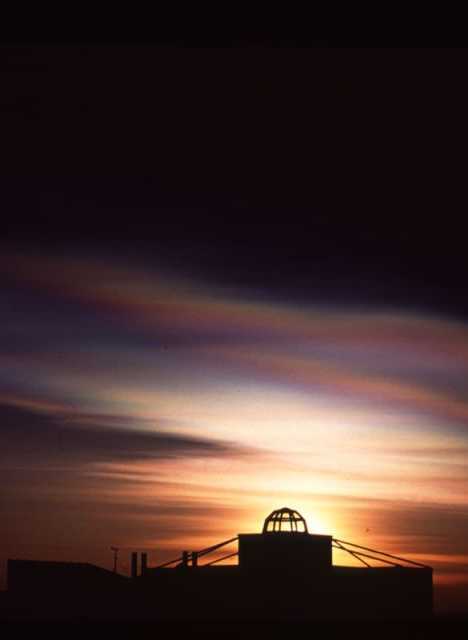 Staff passed the time observing local environmental conditions such as noctilucent clouds. Located on King George Island just off the tip of the Antarctic Peninsula, Russia’s Bellingshausen Station dates back to the Soviet era having been founded in 1968. The station lies within shouting distance of other research bases belonging to Chile, China and Ecuador. What makes King George Island so popular with antarctic base-builders? Maybe it’s the weather, which averages -6.8°C (19.76°F) in August and +1.1°C (34°F) in February. Positively sweltering… if you’re a penguin. Are you praying or just rubbing your hands together for warmth? If it’s the former, then you must be at Trinity Church, the world’s southernmost Eastern Orthodox church. 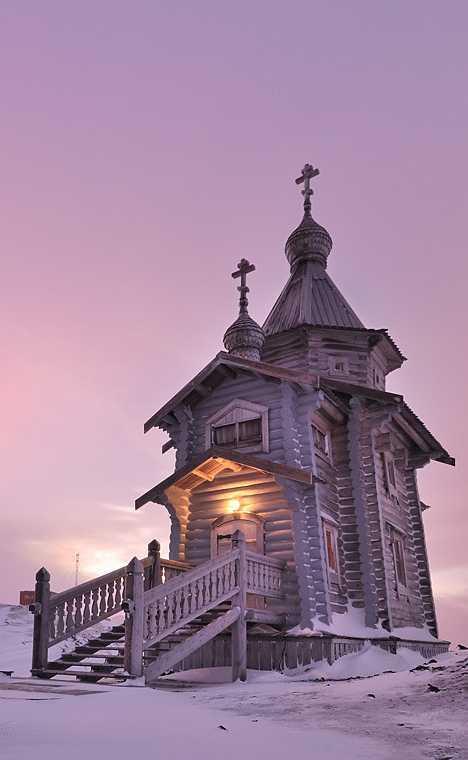 Though it looks much older, the church was actually consecrated in 2004 and witnessed Antarctica’s first wedding in early 2007. If the Estação Antártica Comandante Ferraz looks brand spanking new, that’s because it hasn’t been built yet. The images above come courtesy of Brazilian architects Estúdio 41, who designed this replacement for a previous station built in 1984 but destroyed by a deadly fire in February of 2012. The new 3,200 sq/m (34,000 sq ft) station will accommodate 64 people when it opens in March of 2015.